At the College of Education Fall Faculty and Staff Meeting, several individuals were recognized for their dedicated work and service to the college and the field of education. 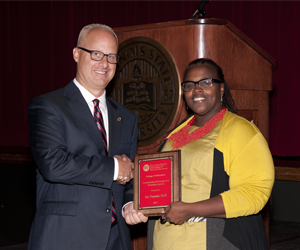 She is a past recipient of the Professor Appreciation Award for Excellence in Teaching and has also been recognized for the quality of her teaching by the Illinois State University chapter of the Student Education Association. Quesenberry accepted the award at the meeting and made a presentation titled “In Loco Parentis,” a Latin phrase that translates as “in the place of a parent.” She spoke of the importance of building trust between educator, student, and parent. She often discusses the teacher’s role of in these relationships in her courses. The College of Education Community, Advocacy, and Diversity Award was presented to Pamela Twyman Hoff, assistant professor of social foundations in the Department of Educational Administration and Foundations. The purpose of the award is to recognize the efforts and contributions of a faculty member who promotes equity and diversity. This award was created as part of a gift from faculty emerita of the School of Teaching and Learning Jeanne Morris. The College Council’s Diversity Education Committee selects the recipient based upon faculty, staff, and student recommendations. 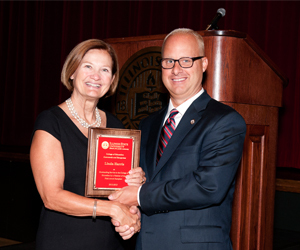 Hoff has demonstrated a commitment to social justice and advocacy on Illinois State’s campus and in the local community. She is a past recipient of the University’s Commitment to Diversity Award. Hoff serves as a faculty sponsor for the Bowman Fellows, My Sister’s Keeper, and Illinois State University Black Graduate Student Association, and she helped organize Illinois State’s first Black Graduation Celebration. This is the second year this award has been presented. The first recipient was May Jadallah, assistant professor of elementary education in the School of Teaching and Learning. The Outstanding Service to the College of Education by a Staff Member Award recipient was Kelli Appel ’89, assistant to the chair for curriculum and assessment in the Department of Special Education. Prior to her current position, Appel was the department’s undergraduate program coordinator, where she worked closely with students, university faculty and staff, and school partners. The Outstanding Service to the College of Education by a Member of the University Community Award recipient was Gail Lamb, Ed.D. ’97, retired senior director of development for the College of Education and the University Laboratory Schools. Lamb’s dedicated service to the College of Education over the last 13 years has resulted in hundreds of scholarship opportunities for teacher education students. She has consistently ranked as one of the top fundraisers in the University, raising millions of dollars for the college and laboratory schools. The Outstanding Service to the College of Education from a Member of the Field Award was presented to Linda Harris ’73 M.S.E. ’90, retired director of human resources for Pekin School District 108. 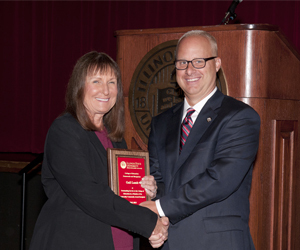 Throughout her tenure, Harris helped dozens of Illinois State University teacher candidates gain diverse and enriching clinical experiences and student teacher placements. Her support for our programs reinforces the importance school partners play in the preparation of future educators.